I didn't even know these existed.. I'll be adding some to my shop next time though! The Galaxy ones are awesome! Uh oh, I love trash chocolate as much as the next guy but these are full of Palm Oil.. a "waste" of paradise indeed! Mmmmm love the Galaxy ones! 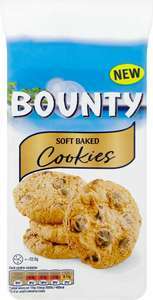 The Bounty ones are very nice but pretty small considering the size of the packet. No way are they worth £2, even a quid is pushing it.